The MRC Social, Genetic and Developmental Psychiatry (SGDP) Centre at the Institute of Psychiatry, Psychology and Neuroscience (IoPPN) is advertising a Studentship funded by Fondation Peters to start in September 2016. The student will become a member of the Emotional Development Intervention and Treatment Lab (EDITLab) within the SGDP Centre, and will be supervised by Prof Thalia Eley & Dr Gerome Breen. The MRC Social, Genetic and Developmental Psychiatry Centre (SGDP) is an interdisciplinary, collaborative research group that combines genetic and environmental strategies in order to study how nature and nurture interact in the development of complex behavioural dimensions and disorders. The EDITLab explores the role of genetic, cognitive and environmental factors in the development and treatment of emotional difficulties. We are at the forefront of a new field called Therapygenetics, the prediction of response to psychological treatment from genetic factors. The successful candidate will work across a range of different samples of individuals treated with psychological therapy for anxiety and/or depressive disorders. 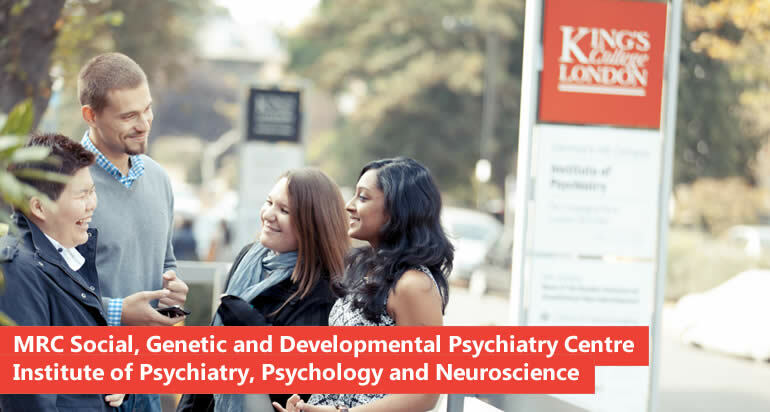 The student will enrol on the SGDP 1+3 programme within which the first year includes training in social, genetic, epigenetic, developmental and cognitive approaches to psychiatry and psychology, as well as a module in statistical genetics. The student will receive training in quantitative analyses of large datasets, using both pre-existing datasets (N ~ 2k) and new samples currently being collected. Specifically, the student will analyse multiple types of –omics data including genomic, transcriptomic and epigenome-wide methylation data. They will also work on data from the UK BioBank (N ~ 150k), the Twins Early Development Study (n ~ 8k pairs) and on methods for the prediction of brain gene expression and epigenetic marks from genome wide genotyping data. The studentship is fully funded and includes a stipend which will be paid at RCUK rates (currently £16,053 per annum) for the duration of the award and fees are met. Limited funding is also available for conference attendance and consumables. The Centre welcomes applications from candidates who have, or expect to gain, at least an upper second class honours degree in an appropriate subject. For this studentship we are specifically seeking candidates with a strong quantitative background so those with a high grade at maths A level or similar, and/or who have experience of analysis of quantitative data in addition to a suitable degree will be prioritised. All applications are considered within a very competitive environment. To apply, you must register and complete the application form online using the King's College London application system. Please first of all select ‘Taught Programme’ and enter the keyword Social. Our "Social, Genetic & Developmental Psychiatry MSc + PhD (Full-time)" programme appears at the end of page 3 of the list of courses. We are unable to accept any applications sent directly to the Centre. Please note: This is a unique four-year interdisciplinary course and, in the first instance, you will be applying for the MSc year, but it is expected that successful applicants proceed to the PhD. This is not a Master's only programme. When making your application, please make sure you apply to the correct course, and not to our traditional 3-year PhD (listed under "Research Degrees"). Why you want to take the four-year interdisciplinary course at the SGDP. The reason for your interest in Therapygenetics. Confirm that your two academic referees are aware that you are applying for a four-year interdisciplinary course which includes a taught MSc component in the first year. Details of A-levels or equivalent including subject and grade achieved. That you qualify as a Home/EU student. International students can only be considered if they are able to meet the shortfall between the home fee and international fee. Please state this in your application. Further information about postgraduate funding options can be found at King's Postgraduate Funding.